The Dagsbrún Library is over a half-century old. Its nucleus was the personal library of Héðinn Valdimarsson. 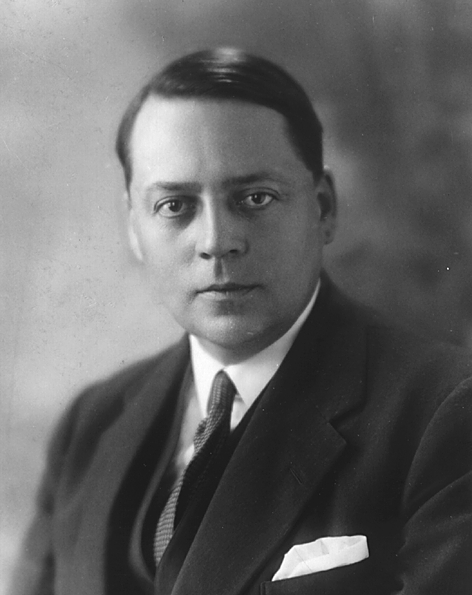 Héðinn was one of the most important early leaders of the Icelandic labor movement and for a long time was the president of the Dagsbrún labor union, as well as the head of the Olíuverslun Íslands oil company and the first chair of the Icelandic Socialist Party. He was also a keen book collector and many of his books originally belonged to his parents, Valdimar Ásmundsson (an editor) and Bríet Bjarnhéðinsdóttir (who was for many years the chair of the women’s organization Kvenréttindafélag Íslands). Héðinn died in 1948. 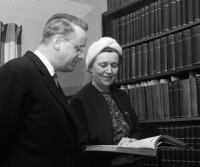 The library was formally founded on the 50th anniversary of the Dagsbrún labor union on 26 January 1956, when Guðrún Pálsdóttir (pictured at right), Héðinn’s widow, gave the union her husband’s library as a memorial to him. The library was formally opened at Freyjugata 27 in Reykjavík, in a building belonging to the masons’ and electricians’ union, on 10 December 1960 and contained 3415 volumes. From then on the library was housed in various places in Reykjavík, particularly in Dagsbrún’s premises on Lindargata. From the beginning, the collection was looked after with deserved care, and librarians meticulously catalogued the collections on typed index cards in the fashion of the time. The library was open to both members of the Dagsbrún labor union and others. Ultimately, though, the union lacked a proper space for the collection and it was packed away in boxes and placed in storage after Dagsbrún, which by then had become Efling, moved to Sæbraut in Reykjavík at the end of the 20th century. On 27 November 2003 Efling and the Reykjavík Academy signed an agreement whereby Efling continues to own the collection, but the Reykjavík Academy houses it and manages it on a daily basis. That same day, the library opened its doors to scholars and to the general public in the Reykjavík Academy. By 2011, the reorganization and computer cataloguing of the collections was complete. In late 2014 the Library and the Reykjavik Academy moved to Þórunnartún 2. The bulk of the library’s collections has always come through gifts, sometimes from authors and publishers but more often from individuals. The library’s largest single gift came from Þórir Daníelsson (pictured), who was the library’s curator from 1973 to 1998, after his death in 2008. Among other individuals who have given substantial gifts to the library over the years are Geir Jónasson, Ásta Björnsdóttir (widow of Þorsteinn Finnbjarnarson), Eyjólfur R. Árnason, Runólfur Björnsson, Guðrún Bjarnadóttir, Skúli Skúlason and Ágústa Jónsdóttir, Ásgeir Pétursson and Dýrleif Árnadóttir, Sverrir Kristjánsson, Eðvarð Sigurðsson, Selma Hannesdóttir and Þorvaldur Þorvaldsson.